As soon as you arrive at the office every morning, you get right to work responding to emails and writing reports. Noon rolls around and you’ve got just enough time to scarf down your lunch before heading into your next meeting. And before you know it, it’s 3:00pm and you’re feeling like you just need a little break to stretch and look at something other than your computer screen. And then, you realize the coffee pot is empty. We’ve got you covered. Here are 4 quick ‘desk-ercises’ you can do to get your blood flowing for a productive afternoon. It may sound simple, but it’s very effective. This move will help get the blood flowing back into your legs. Don’t want to call attention to yourself? Simply ‘walk’ in place by lifting your knees high! Or maybe you want to spice things up. If that’s the case, you can pretend to jump rope. If jogging in place doesn’t sound like your thing, hop out of your chair and take a little stroll down the hall. That’s a great time to use the restroom or grab a snack from the breakroom. Heck, you can even go big and take a little jaunt outside the office! Ask a coworker to join you and gossip about last night’s episode of the TV show you both enjoy! The fresh air will be great for the body and the mind! 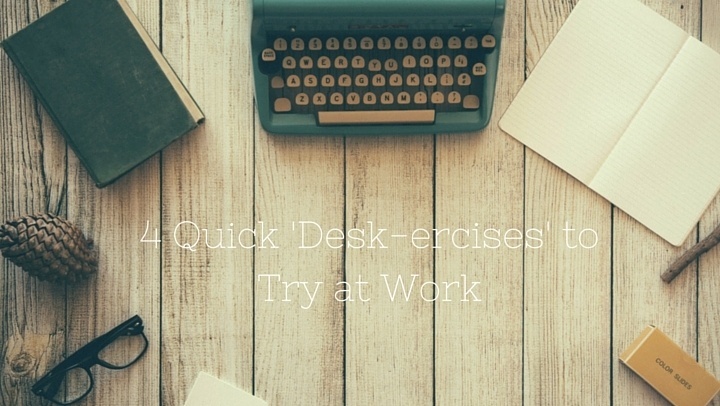 This one is for those of you who just can’t get away from your desk during the day. Leg raisers are great for working your thighs and abs! Here’s how: Sit in your chair with your back straight and chest out. Simply straighten your legs and raise them until they are at waist level. Hold for 20- 30 seconds. Repeat two to three times. Want to make it more difficult? Hold the right leg at waist level while raising and lowering the left leg fifteen times. Then switch for the other side. And if you really want a good workout, use a purse or backpack around the legs for added weight. Can’t get to the gym tonight? No worries, try these squats at your desk and you’ll be set (only kidding, fitness gurus out there). Stand with your chair behind you (make sure your chair doesn’t roll away!) and your feet shoulder-width apart. Keeping your chin up and back straight, lower (squat) yourself towards the chair without actually sitting down. Then straighten your body upright. Repeat 8-10 repetitions, 3 sets total. Your thighs and glutes will feel the burn!